Gallagher can teach a hell of a lot of people a few lessons here. Shall we start by saying that this is an above standard album. A good one. Then I’ll tell you that it was recorded in a matter of hours at London’s Tangerine Studios, a diabolically small, insignificant place up the East End. And yet Gallagher, who produced it as well, has created such a wonderful live sound you’d think the band was playing in your living room. There’s precious little overdubbing, almost no sophistication, but that’s what Gallagher’s all about, racy, emotional, raw. This, his second album since Taste, shows him as a more varied musician than most people would ever imagine. 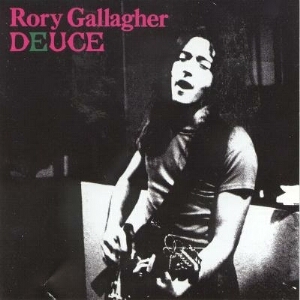 There’s the uncontrollable rocker on “Used To Be,” chunky, funky riffs, and then a little country on “Maybe I Will,” with Rory on nicely rhythmic acoustic guitar and harmonica. His actual guitar playing becomes even more unmistakably unique to him – the tone, then rushing, gabbling qualities, and only the slightest temptation to use the cloak of electricity. His songs have improved ten-fold, there’s something to them now, more thought, more music. But he isn’t selling-out – there’s the brash, unkempt feel on strict rockers like “Whole Lotta People” that literally heaves itself out of the speakers. Praise must be handed out to Gerry McAvoy and Wilgar Campbell. Wilgar displays some extraordinary drum technique, while McAvoy shows what a fine, pushing bassist he is. This is a great rock band with another wildfire album. – R.H.